An easy hike from renowned Moraine Lake in the Canadian Rocky Mountains, hikers are rewarded with two alpine lakes (Lower Consolation Lake can be seen here), a glacier hanging off Quadra Mountain (on the right) and adjacent Mt. Bident. The glowing orange is from larch trees on the slopes of Panorama Ridge. This is an incredible photo Frank. 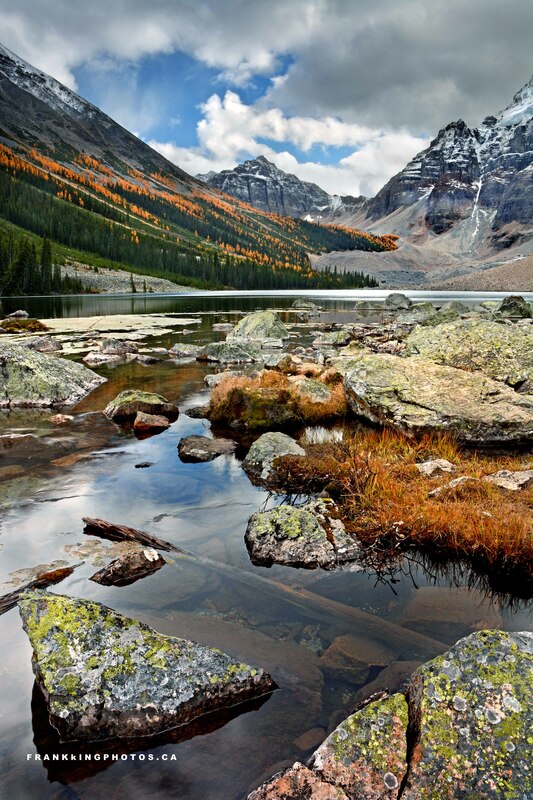 The fall colours are stunning and surrounded by these majestic mountains it is – beautiful! Outstanding photo, Frank — the orange larch trees are a unique element.